Directional Drilling also called directional boring is a procedure of installing underground pipe, cable, or conduit in a shallow arc along a prescribed bore path using a surface-launched drilling rig, with minimal impact on the surrounding area. 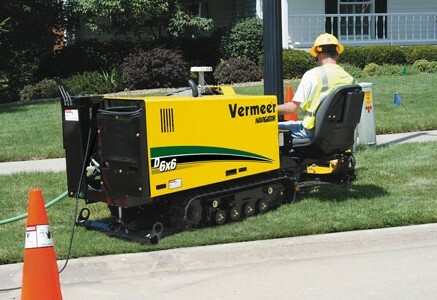 Directional boring is used when trenching or excavating is not feasible. It is suitable for a variety of soil conditions and jobs including road, landscape and river crossing. For a video description please watch the video below. Directional Drilling can be carried out with minimal disturbance. There is no disruption to road or concrete and no scarring of the landscape or ground. Directional drilling is also unaffected by above ground obstacles such as buildings and trees or by existing services. In many cases this leads to significant cost savings when compared to traditional trenching methods. Another big advantage of directional drilling is that it can be carried out in various types of soil, dirt, clay, gravel, cobble and rocks. The ground conditions can affect the lengths and size of the holes and the trenchless drilling rig used will vary depending on its pullback capacities.